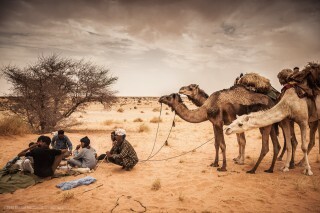 My gallery from Mauritania, part 1. You have really nice pictures. I will say you've got a few of your facts wrong. After living in a remote part of the Inchiri for a few years, with good friends in most of the places you visited, I don't think you gave a great view of who these people are. First of all, just because a guy wears a scarf over his faces does not mean he's Tuareg. You actually don't even find much or any Tuareg that far west. Mali yes, but Mauritania has different ethnicities and languages. Those graves are actually military markers. And for your future trips to travel-advisory areas, can I make a request not to make it seem like everyone wants to rob you or kill you. First of all most of those people hate the reasons for unrest in their countries too. Hi Felipe, thank you for taking your time to post the comment. It was our guide who told us those were graves. I have virtually no way of verifying whether he was wrong, so I will mention in the gallery that there is some doubt about that. They were wearing *blue scarves* though, and were not Arabs. It isn't me suggesting it's not a safe area, it's the UK government. Perhaps this isn't clear from the gallery. We felt safe, like I said. Thanks for the reply. They might have been of Berber descent, but blue scarves don't mean that someone is Tuareg. Blue dye happens to be the cheapest dye out of all the colors. And a blue "howli" is probably the most common across the countryside regions of the North. Is that so? I only know that back in the day blue was the most expensive colour for painters. Thanks once again, I will update the gallery early next week. Right, I have now updated the gallery, thanks once again!